The routine beat of the human heart is easy to take for granted—unless you are one of the seven million patients in the U.S. with atrial fibrillation (A-Fib). With A-Fib, the heart’s two upper chambers beat erratically and out of sync with its two lower chambers, causing a quivering irregular heartbeat. Left untreated, this type of arrhythmia can lead to life-threatening blood clots, stroke, heart failure, or other heart-related complications. What makes A-Fib especially hard to treat is that it presents in different ways, depending on the patient. A-Fib occurs in young and otherwise healthy patients and in older patients with structural disease or severely scarred hearts. Each individual is unique, and so is their A-Fib. Treating A-Fib requires precise treatment therapies that are tailored to the unique mechanisms of an individual patient’s heart. That’s the greatest challenge—determining the exact timing, sequences, and locations of the electrical signals in a particular heart. There hasn’t been a reliable device to map that activity in the heart without placing catheters inside of it—until now. Thanks to a generous gift from the private Seraph Foundation, Mangrum and his team recently acquired a new mapping system designed to analyze A-Fib electrical signals. 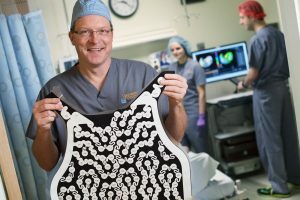 The system, produced by Medtronic, uses a vest with multiple electrodes to allow real-time, non-invasive, three-dimensional mapping of a patient’s heart. The mapping information, when integrated with imaging data, may help select patients who will respond well to particular procedures, such as ablation to eliminate heart tissue responsible for triggering an abnormal rhythm. For more than two decades, UVA has been a leader in A-Fib research and care. UVA’s Atrial Fibrillation Center, established 13 years ago, is a model for cardiac care nationally. Mangrum and UVA’s heart rhythm team see about 3,000 patients annually from all over the U.S. and the world, with a range of ages and conditions. They handle cases of high complexity, treating patients who might be turned away elsewhere. They are always looking for new solutions to heart rhythm problems. Private support helps UVA bring together various disciplines to better understand the causes of A-Fib, develop innovative treatments, and assure the best care for patients. With innovations like this mapping system and the expertise to use it effectively, UVA’s Heart and Vascular Center remains one step ahead in the treatment of atrial fibrillation. For more information on the Medtronic CardioInsight™3-D body surface electrocardiographic mapping system, see this more detailed article in UVA Physician Resource.